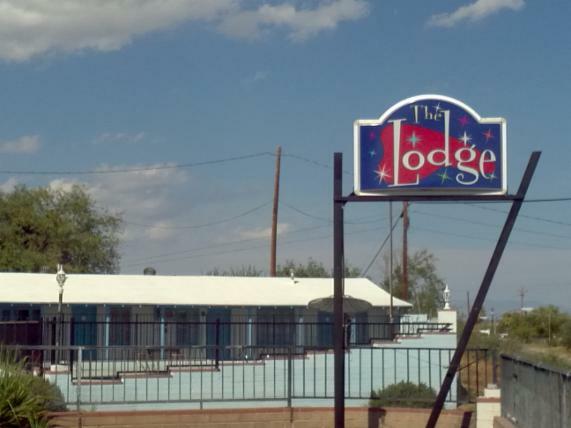 This is now "The Lodge" in Mammoth Arizona. In the late 1940's and early 1950's Mr. and Mrs. Allen had a dream. 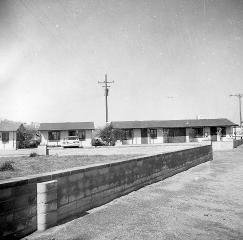 They were living in Winkleman, Arizona, which is 23 miles north of Mammoth, when they decided to build a motel. They chose Mammoth, Arizona for their location. 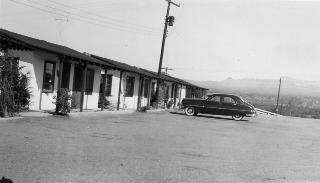 They named the motel "Sierra Vista Motel" which means "View of the Mountains" in Spanish. 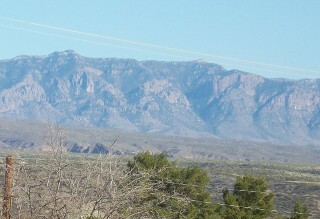 The Old Highway 77 was still used as a main highway between Tucson and Globe. 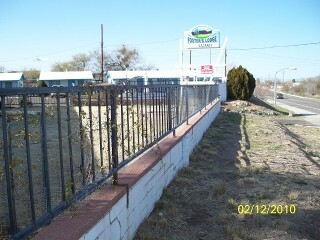 Below left is a picture of that time in front of the motel. 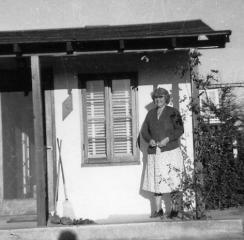 The Allens lived in one of the cottages while the main house was built. 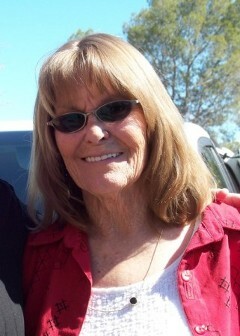 Below is Mrs. Allen in front of room No. 5 at that time (No. 6 today). When the State decided to build a new road in 1961 from Tucson and Florence North to Winkleman, they went to Mr. and Mrs. Allen and asked for part of their property so they could put the highway through there. At that time they told them they would build a wall around their property. Bottom left is a picture of the wall. Bottom right is the first Foster's Lodge sign. Debora Foster is an artist, and she designed all the artwork for the first sign and mountain view in the oval of "sign of Foster's Lodge in 2011"
When the Foster's owned the motel, they changed the name to "Foster's Lodge". I hope to continue the legacy that the Allen's started by trying to put back some of the 1950's and 60's charm, but making sure you can still have the long reach of the world via the internet too. As of October 2014, we have put up a new sign. 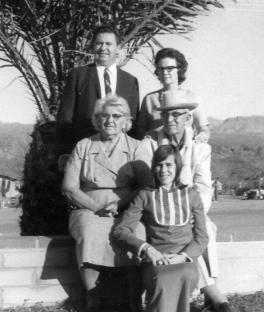 From top Mr. and Mrs. Allen in the center seated with their Grand son, his wife and their daughter. From bottom left Karl "Hoss" Foster and bottom right Debora Foster, the previous owners. View of the old trail up to Copper Creek. 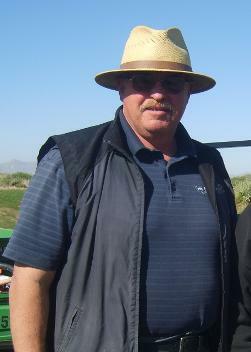 The Lodge is under new management as of November 2013. Her name is Violet Blankemeyer.